The first, and I mean the FIRST guy who asks if this is “…one of those kit-cars…” is going to get one of these bronze windshield posts shoved right up his arse. Up until yesterday, I had the posts and windshield frame just loosely bolted on, and no hinge bushings in the posts, and it looked reasonably OK.
Until I tightened things down a little. Then everything was all kinds of off. The left had post stood up several degrees more vertical than the passenger side, and didn’t lay right against the cowl. The windshield bound in the pivots with the bushings in, and the pivot stud would barely go through its hole in the (apparently twisted) left side post. I ended up spending the afternoon getting these reproduction posts to fit the cowl of the who-knows-how-old, unknown maker fiberglass body, and accept the original, but chopped two inches, windshield frame. Some (OK, a LOT) of “finessing” with a 4″ angle grinder on the bottom of the post flange, a little work with a hole saw to allow the mounting bolt some wiggle room, some time clamped in the vise with some precision re-shaping with a big Crescent wrench, and “Ding-Ding-Ding”, we have a winner. That was after I made new brackets on the cowl brace to move the steering column two inches to the left and down a half an inch because the wheel was in the wrong place, and the brake pedal hit it. This car has been a series of challenges to make things fit properly. I started with the doors. Broken hinges. Poorly mounted latch hardware. Nowhere near enough bracing. Turnbuckles to twist the doors into submission. Shimming the body on the frame for gaps. Remounting and aligning the rumble lid hinges. Filling and finessing the fit of the rumble lid to the body and tulip panel. Making cowl to frame mounts (a vital part of old Ford body alignment that this car never had). Getting the Rootlieb hood to fit the Argentine reproduction grill shell, and then getting the hood to fit the cowl AND the grill shell at the same time. The splash aprons, which are still going to need a bunch of Mar-Glas and ‘glass mat and resin to fit properly. And that’s just the body. I built the frame too, not having ever dealt with a buggy sprung Ford chassis before. Todays project was to rebuild and lengthen the Spartan trailers tongue and install the power jack. Why I haven’t used these on every other trailer we’ve done is a mystery, this thing is the bomb! Instead of cutting the tongue off and making an entire new one, I simply “sistered” a length of 2×5 mild steel tubing onto the existing tongue, lengthened it about two inches, didn’t have to change the angle or alter it in any way. I’m happy with the result, it’s long enough to use the Reese load level hitch bars, and the power lift is really, really nice. I assembled and welded the new legs onto the new coupler before I welded anything on the trailer tongue, which was a bit of foresight I usually don’t have. The bottom has strips of 7 gauge steel strips welded to the new legs, which I welded (from above) to the inside of the original channel. The top is welded solidly, as well as the ends. I’m proud of the stick-welded job, it looks good, and the ancient coupler/jack is headed for the scrap pile. I temporarily wired up the thermostat/control for the roof mounted A/C-heat pump, and like everything else, it fired right up and works AMAZINGLY well. The A/C is ice cold, the heat works, and it’s all controlled by the wall mounted ‘stat. Pretty high tech for me! I had gotten the fridge vent stack installed as well, and wired up the 12V feed to it, and started it. It cools down as it should, and while I had no doubt it would, it’s nice to verify it works after all that effort, and trading a really nice vintage camper I bought last winter for it! The water heater is also vented, the cap is on the roof covering both vent stacks, all that remains to be done is to plumb the 3/8″ soft copper line to them both, and the kitchen stove. On the ’34 Roadster front, some progress too. I put together the body cradle I’d made for the ’36’s body, and got the ’34 body safely setting on it instead precariously perched on jack stands and a jenga-like stack of 4×4’s. The rear end is mocked up, and I decided the flimsy looking hairpin radius rods that came with the project weren’t going to cut it. Instead, I started making a set of really beefy, and traditional looking, hairpin rods from a seat of ’36 front wishbones I had. I like how they look, and once I get the spring clamps I ordered from Mac’s Antique Auto, I can mount the rear axle and set the chassis on it’s wheels. Big step! Stay tuned, summer is coming, I want to get the Spartan done in time for our July 4th stay at Gun Lake, so I’ve got a lot to do! Hot Rods! Old Trailers! Projects! Adventure! It seems like a long time since I worked on the trailer, in reality, it’s only been a couple weeks. I’ve decided that the goal of making Camp Dearborn and the Tin Can Tourist Spring Rally isn’t going to happen, so I’ve slowed down a bit, but I’ve still gotten quite a bit done. 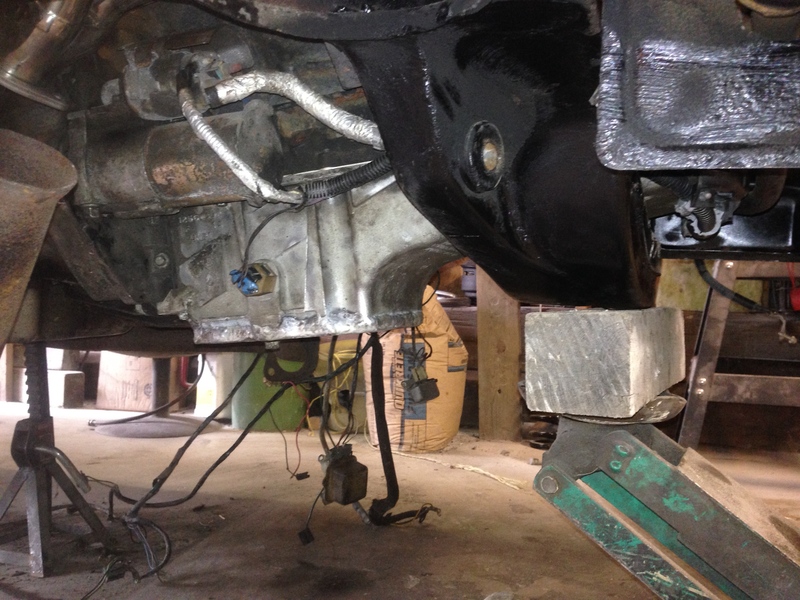 The new axle is under the trailer, and the Dodge 17″ 8 lug wheels and Michelon 24575R17 10 ply rated tires are on. The trailer now looks like ours, it looks good and feels good having that chore done. In addition, both waste tanks are under the trailer and the plumbing is 90% complete, so there are three things (almost) checked off the list. Most of the trim is done inside, I have to steam and bend a couple pieces of quarter round, and cut the hole in the roof for the fridge and hot water heater vent, finally get the interior varnished, and a thousand other little jobs that I haven’t even thought of yet. So, that’s what’s happening here at Cool McCool’s Garage, progress on two fronts! A Facebook friend in California just relayed that he’d found a cool old bread loaf style trailer near his home. Prewar, intact, fairly priced, but a total rebuild. He was torn, because he has a very cool, very rare trailer now, and this other one would be a nice compliment to their current one, and his vintage tow car. I should take a lesson from that. While I’m making good progress on the ’47 Spartan, it’s down to the fussy finishing and detail work that I’m not fond of, not patient enough for, and takes more time than I want to spend. It’s also clear I’m in no way going to meet my (self imposed) deadline of having the trailer done by the third week of may for the Tin Can Tourist Spring Rally in Milford to debut. I could have it usable, but not finished, and I don’t think it’s worth taking it uncompleted, not polished or finished to the level we want. It’s disappointing, but not we have two others to use, and lots of events coming up this summer where we can “debut” in style. I have the plumbing done, the fridge is in and the vent system roughed in. Had to order more Olympic rivets before I can cut the vent hole in the roof and move the original stove vent blister to that space, so that’s a bit of a hold up. The plumbing is done, mostly. The grey water tank has to be hung and the sink drains run to it. My good friend Mike Greene of Sierra Custom Interiors gave me a bunch of PEX tubing drops, crimp rings, miscellaneous fittings and the crimping tool, I’m indebted to him for that. It went well, it’s always good to add another thing to my skill set. The trim work is also 90% complete. I steam bent the curved pieces with a home-built steamer set up, my first attempt at bending wood. It went pretty well, and I have a few little pieces yet to go that can’t be done till some other things get done, like the fridge cabinet. We have the interior fabrics, thanks to another friend who’s an upholsterer and let us buy the fabric on her account for half what it’d have otherwise cost. The foam we have to order, but she’s helping us out with that too. Kim will make the covers and curtains. It should be very dramatic, we’re excited about our choices, no peeking until we’re done! All this is good, and I have to admit I did feel relief whenI decided the other day not to try to have it ready for May. It was like a weight had been lifted. Not that I’m not working on it, but the pressure is now off. I was feeling a bit overwhelmed by that project, and seeing my long neglected Thunderbird, the half-completed ’63 Riviera I started last year, and the “new” ’34 roadster setting in pieces, all of them covered with a thick, soft layer of wood dust, was a bit overwhelming. These three cars are cars I’ve loved since I was a kid, and always wanted. The fact that none of them are completed and drivable doesn’t really matter, because I love having a project, but three at once, along with normal maintenance on our other cars, not to mention household chores, lawn care, and so on, takes tool on my “free” time. Part of my rationale for having all these projects is to provide activity for my upcoming retirement, so the fact that they’re not finished shouldn’t be a stress factor. It seems a long way off, but I know that 4 years from now I’ll look back and wonder where the time went. And what I was worried about. Spartan Trailer Progress: Will it be finished by May? I have a little space heater in the trailer, a fire in the stove in the shop, and I’ve been busy doing what I consider “cabinet work”, although I’m sure my high school shop teacher, and my brother-in-law would shake their heads in disbelief and walk away, I think I’m making progress. Above, we have the beginnings of a lunch counter, which we had to have because we bought two of these killer bar stools right after we bought the this trailer (a ’47 Spartan Manor). Seen here in it’s first, roughed in state as a wiggly bunch of sticks, I had to take in the trailer and see if was actually going to fit and be useable. Once again, we’ll have a wrap around shelf under the panoramic front windows, that’ll continue down the top of the booth to display stuff. That was one feature of the ’46 that we really liked. This should be a notable improvement over that trailers seating. I’m waiting to get the beautiful (but slightly larger than we really want) vintage GM Frigidaire fridge (that we scavenged from the Spartanette we bought this summer, along with the Dixie stove) from the shop that’s converting it from electric to RV propane and 110V operation. This was all arranged by our good friend Mike Greene of Sierra Custom Interiors, a fellow TCT member and all around great guy. It should be done next week, then I’ll be able to build the sink and fridge cabinets, and complete the bathroom. I’d like to have the fridge on hand to assure I build things correctly, all these other things hinge on where and how the fridge will be positioned. Also in the wings is the beautiful little Dixie gas range. This too was scavenged from the Spartanette before it left. It’s in great shape, although the clock lens was broken the face of the clocks graphics are peeling, and the springs which hold the oven door closed are both broken. All this stuff should be easy to fix, the stove and fridge will really set off the interior of the trailer. The street side cabinets are framed in, with space for the stove, and the lavatory sink is in place behind the little partition between galley and bedroom. This all fits well and looks great, we’ll have a simple display shelf above the stove, no upper cabinets on this side of the galley. Todays project, in bitter cold, was the wardrobe cabinet that is just inside the front door, where the original furnace sat. I all the interior doors, kitchen doors and drawers from a ’49 Imperial Mansion, and am using what I can in this Manor. Two of the wardrobe doors worked perfectly for our wardrobe, I’m very happy with how this turned out. The sink, a stainless double basin unit with built in drain board from IKEA, will be just aft of the wardrobe, and the fridge will set somewhere behind that, which will also determine where the partition for the bathroom will be. I cut down a small pair of what had been overhead cupboard doors from the Mansion to use as upper doors. I’m pleased with how it all came together. It’ll looks original, but will be all modern and very functional for our needs. About all I can do until the fridge is done and on hand now is to frame in the bed base in the back, and I can start cutting making cabinet doors, as I don’t have enough of the correct size to re-use from the Mansion, and originals from this trailer are trashed. In other news, the Traveleze trailer I bought a couple weeks ago has a new home, Mike Greene bought it and is going to restore it for his family to use. I had a small mishap with it, got stuck in the snow trying to back it in the barn at my dad’s to keep it out of the weather. I could only back up, the truck kept sliding a bit sideways, and I ended up backing it into a small tree at the edge of the drive. This wouldn’t have hurt it a bit, but it turned out the wood framing at the rear of the trailer was completely rotted away, and the siding buckled, revealing the beginnings of a black hole where the trailers framing should have been. This was demoralizing, I’d hoped to use it as is, and with the Spartan project, and the three car projects now on hold until that gets done, I just didn’t want to fix it. Mike didn’t care, planned on a complete rebuild of whatever trailer he found, so we cut a deal, he came and got it yesterday. Everybody’s happy! That’s Mike, happily changing wheels and tires for the trip to Bristol, Indiana! Gilmore Car Museum and Center for Physical Therapy. In the Cadillac building, a beautiful recreation of the Cadillac approved Art Deco dealership building design from the late 30’s. Since my hip replacement a little over a week ago I’ve been going over to the Gilmore museum every day for a walk. I’ve graduated to being able to use a cane, rather than walker, which is good, although it does make me rather sore later on. Going through the museum at my forced slow pace enables me to notice things I’d normally breeze right on buy. My visit yesterday was focused on the Model A museum. I admit I’m not very enthused about Model A’s, particularly in stock form, but the versatility and adaptability of this humble depression era car is amazing. From family transportation, to marine, medium duty truck, and even aircraft, the reliable little Model A kept America moving during the tough 30’s, into the 40’s and 50’s, and continues today as restored and hot-rodded little Fords are still going strong. A break in the still open “Blue Moon Diner” was a welcome stop for a root beer float. The museum was very busy, but I managed to belly up the much counter and get an empty stool to enjoy my float. Parts counter in the Model A museum. Stay tuned for more hip replacement recovery, rehab and fun. I’m hoping to be able in the next couple weeks to be able to a little light work on the Spartan trailer project. For now I still need to use a cane or walker, but as rapidly as this seems to be progressing I should be back at it, at least in a limited way, pretty soon. Thanks for visiting, see you next time! 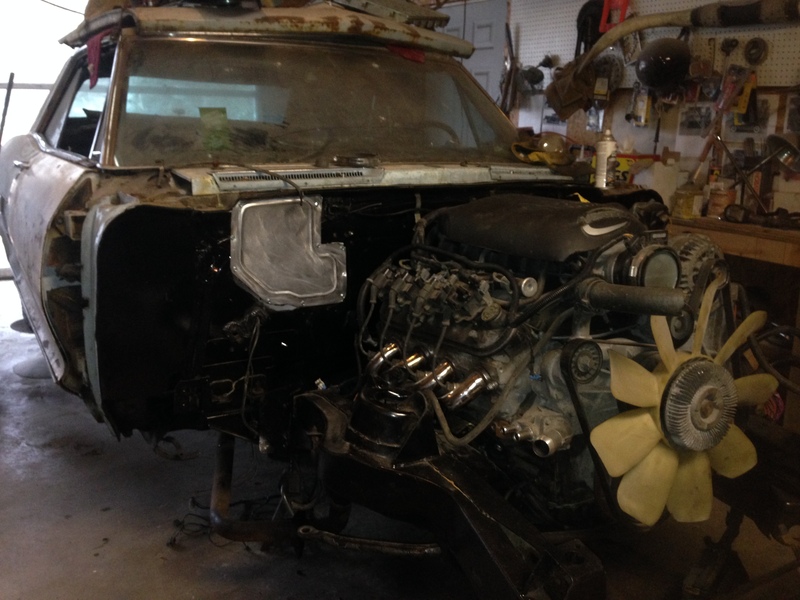 I came in from the shop day before yesterday, and announced to my wife that the engine was in the Riviera for the last time, a big milestone in this build. Then, I added somewhat regretfully, that I didn’t use the 5.3 Vortec truck motors original cast aluminum oil pan, sectioned 2 1/2″, because I ran into difficulty likewise shortening the pickup tube for the sump. I did manage to shorten it the needed amount, but I was having difficulty making the bracket that secured the pickup tube to the windage tray, and wasn’t really happy with how any of it went. So, in frustration after nearly all day working on this, I put the GM engine swap oil pan on the engine, and put the engine/trans in the car, even though the sump on this pan still hung down below the front crossmember about an inch and half, making the oil pan the lowest part of the chassis. Not a good thing, on a car with airbag suspension. She looked at me with an expression of disappointment mixed with irritation (one husbands know well), and said, “I thought that was the point of having the other one shortened? I thought was the whole point of the air bags, to get the car really low?” She shook her had and walked away. I slept on this, and yesterday, pulled the motor back out, took the pan (a GM engine swap pan for LS engines with a slightly shallower, narrow sump to fit these early chassis, to replace the REALLY deep sump truck pans), and with a clear mine, fixed the recalcitrant pickup tube mounts, put it all back together with the modified truck pan, and put the whole thing back in the car. I also “fixed” the trans crossmember, and made a nice bead rolled panel to blank out the firewalls heater box opening. I much happier with the modified pan, it’s the same depth as the front crossmember, and I won’t have to hang my head in shame and call a tow truck when I forget to air up the bags and drive off, or catch the pan on a railroad track or manhole cover.